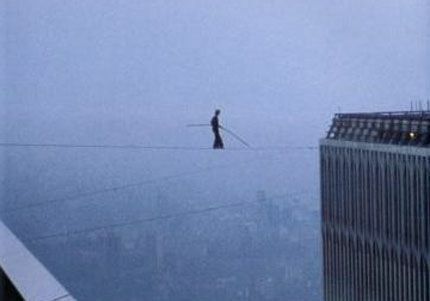 In order to stay true to the wide variety of films I suggest, I'm going with another documentary, Man on Wire. It's not as cool and action-packed as Man on Fire, but it's still a pretty cool flick, and that's coming from someone who doesn't like most documentaries. 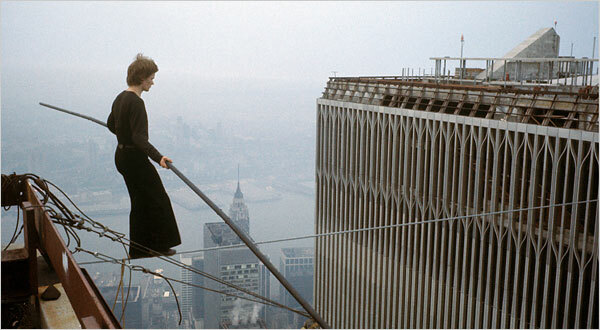 Man on Wire is about Phillipe Petit's 1974 highwire walk between the Twin Towers, 1,350 feet in the air. Phillipe is one of the rare brave Frenchmen, who is wire-walker, magician, unicyclist and street performer. Talk about a renaissance man! He was sitting in a dentist's office when he saw a drawing of the proposed towers and knew he was destined to conquer them. As someone who is terrified of heights, how in the world did he pull that off? And not only did he pull it off but he went back and forth eight times. Unfortunately, the walk was illegal and he was arrested. The man is always trying to bring you down. The movie shows old "training" footage as Phillipe prepares for his walk, along with photographs of the walk, reenactments and present-day interviews with the participants. It can get boring at times but overall, it's a really cool story and is opens your eyes to how crazy/brave this guy really was.